How to set up a photography or business Instagram account in under 10 minutes. 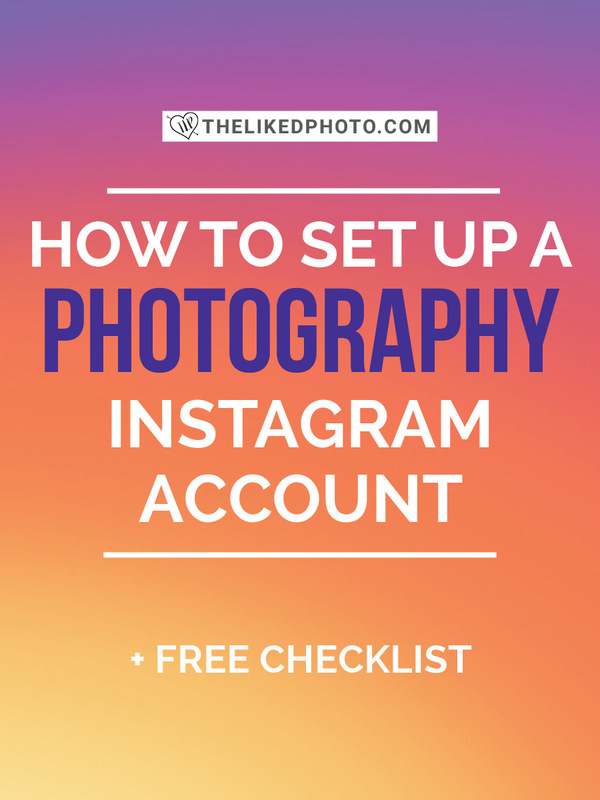 Includes a FREE Instagram checklist! Instagram has over 900 million monthly users and growing! That's a lot of people to make an impression on with your Instagram account! It’s become the new business card and can make or break your brand or business. As a photographer, I've found Instagram to be one of the best marketing tools for my business and an excellent way to meet people, connect with brands, and expand my creative passions. Instagram's simple visual platform makes it unlike other social networks, delivering a "quick fix" and gorgeous compositions. It's no longer just for selfies and cat photos! Just as when you meet someone new, your Instagram account's first impression should be your best. There are thousands of photographers and businesses using Instagram to market themselves. How can you be different? What do you have that no one else has? These are important questions to ask yourself before getting started. Use an email that people will be able to find you by or an email that some of your clients/friends may already have saved in their phones. 3.) Choose a recognizable username for your Instagram account. This is going to be your brand! Most people just use their names but feel free to use something catchy, brand related, or even a little out there. Just make sure that you can identify with this name and that it's memorable. Avoid names with periods, underscores, double underscores, or unordered letters. You want it to be easy for people to find you! Never do double or triple underscores - it makes your account harder to find. 5.) Tap the +photo at the top and add an image - remember this is going to be very small but should be a photo of you, your work, or a logo. Again, memorable and makes an impact. This photo can be changed from time to time as your account grows. 7.) Once you are into your account, click the lower right corner and open up your page. You'll see an area to edit your profile. Profile name: Add your business or full name and add a location or niche. Use keywords that describe your business or niche. When someone searches for these words on Instagram, your account has a better chance of being seen. For example, I used "Anna McNaught | PHOTOGRAPHY" on mine. Examples: Photography, your location, Art, Design, Surrealism, Portraits, Blogger, World traveler, etc. - whatever your niche or location is that could drive people to your page. Here is my current bio. I change the call to action and website about once a week to keep up with my latest promotion. Click edit profile to make changes to your bio. Here is where you can edit all of your Instagram settings and profile details. You can also change your category and contact info as well. Bio: It's important to keep it clean, easy to read and professional. I recommend putting a location, a few words about what you do, and (optional) some social proof, ex: as seen in Forbes. CTA: The Call to action is one of the most important sections on your bio that most people seem to miss. It's a chance for you to tell your followers why they should click your link to learn more about you or buy from you. I am constantly updating this and changing it so keep that in mind when you make yours. It doesn't have to be perfect just yet. URL: This is the only active link on your whole page (other than stories past 10k) so use it wisely! Most people put their website or down the road it could be used for advertisements, blogs, YouTube account, webinar announcements. etc. I also recommend checking out Linktr.ee. This site allows you to use multiple links. If you have a Facebook page, now is the time to enable Instagram for businesses. This will pull information from your Facebook page and create a CONTACT button that will link directly to your email for fast communication. Make sure your account is public and tags are set for automatic. This will also allow you to use analytics, create promotions and tag brand partners, and select a category for your page. Analytics are one of the best ways to test and track. You can see how many followers you are gaining per week, your impressions and overall engagement, and how one post performs compared to another. These are key for learning and improving on the state of your page. Start with 10 solid photos on your Instagram account before following anyone. Don't worry about the time frame on these and just build your profiles foundation. Choose some of your best saved photos and post! Be sure to write an engaging and interesting caption to go along with each post and include 15-30 hashtags. Don't worry if you don't have anything yet; we will get into the details of photography later on. In this case, just post one or two photos of yourself or a favorite image of yours with a caption introducing yourself to Instagram! Captions can be directly related to the photo or a random thought, quote or idea. I see people using their captions like a journal to tell a story about the photo or about something that is currently going on in their lives. Captions are just as important as the photo and can add more value and interest to the image. Longer captions tend to perform better on Instagram but this doesn’t mean that you have to go crazy writing a novel on every post. Just write something that is interesting and relevant to your audience. They’re also a great place to share tips, announcements, or daily thoughts. Ask a question. It can be as simple as "how was everyone's day today?" Or say for example you post a beach photo, you might ask your audience, "Where are your favorite places to travel to?" Questions will encourage your audience to respond which in turn brings more engagement and boosts your posts in the Instagram algorithm. Ask for viewers to do something specific such as participate in a contest or follow a page that you admire. Just don't be spammy and ask them to follow you - that makes things awkward. Next, add your hashtags. I recommend using 15-30 on every post and mix them up. Click below to read more about hashtags. Now that you have a basic foundation set up on your Instagram account, it's time to start following a few people. Start with people you know. Click on your profile and click on the upper right corner to connect with people from Facebook and your contact list. Past clients may already be on Instagram ready for you to follow. Start following and liking people's posts. In most cases, they will start following you back. Click on the little heart Icon at the bottom of the phone screen to see who has "followed you," "liked" and "commented" on your photos. Spend a bit of time familiarizing yourself with the platform. Ready to learn even more and grow and make money from your Instagram? Check out our full Instagram Course! Congrats on your new Instagram account! Grab the free checklist below so that you never miss a step!